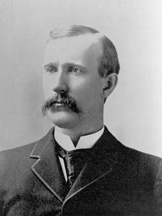 KYLE, James Henderson, a Senator from South Dakota; born near Xenia, Greene County, Ohio, on February 24, 1854; attended the public schools; completed a course of civil engineering at the University of Illinois at Urbana in 1871; graduated from Oberlin (Ohio) College in 1878; prepared for admission to the bar, but entered the Western Theological Seminary, Allegheny, Pa., and graduated in 1882; pastor of Congregational churches in Echo and Salt Lake City, Utah, 1882-1885; moved to Ipswich and later to Aberdeen, S.Dak. ; pastor; financial secretary of Yankton College; elected to the State senate in 1890; elected as an Independent to the United States Senate in 1891; reelected in 1897 and served from March 4, 1891, until his death; chairman, Committee on Education and Labor (Fifty-third, Fifty-fifth and Fifty-sixth Congresses), Committee to Establish the University of the United States (Fifty-fourth Congress); chairman of the United States Industrial Commission 1898-1901; died in Aberdeen, Brown County, S.Dak., July 1, 1901; interment in Riverside Cemetery. Dictionary of American Biography; Pressler, Larry. James H. Kyle. In U.S. Senators from the Prairie, pp. 31-40. Vermillion, SD: Dakota Press, 1982; U.S. Congress. Memorial Addresses. 57th Cong., 1st sess., 1902. Washington, D.C.: Government Printing Office, 1902.